First of all Happy Raksha Bandhan 2018 in advance. If you are looking for when is Raksha Bandhan 2018, we have provided complete information about Raksha Bandhan 2018 date and day here. Raksha Bandhan is the festival which symbolizes the love and bond between brother and sister. It is a Sanskrit word in which “Raksha” means protection and “Bandhan” means “the act of tying, fastening or binding”. So, Raksha Bandhan is festival of tying a “rakhi” or amulet or talisman on the wrist of brother by sisters or priest on the wrist of their patron. In return, brother gives a small gift to the sister and also promises to protect her. Raksha Bandhan is celebrated all over northern India. But it is also celebrated in parts of western India, central India, and Nepal. Also celebrated in the former colonies of British Empire where Hindus emigrated during the 19th century. But, now Raksha Bandhan has spread beyond its traditional regions via technology and migration, movies, social interaction etc. It has other names like Rakhi, Saluno, Silono, and Rakri. Raksha Bandhan is celebrated on the last day of Shravan month of Hindu Lunar Calendar, which usually falls in August. On this day sisters of all age tie rakhi on the wrist of their brothers. In return brother usually, give small money as a gift, also promises their sister to take care of her. So, “Rakhi” actually means ” a protective talisman or thread, with rosette, tied ceremoniously around the wrist of protector or patron on the full moon day of the Shravan month. 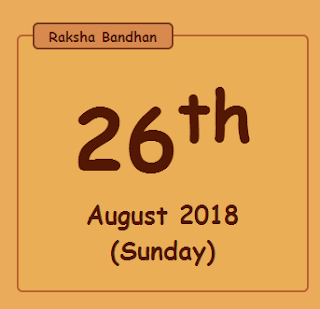 So, Raksha Bandhan 2018 date and day is on Sunday 26, August 2018. There is one ritual associated with saluno in which sisters put shoot of barley behind the ears of their brothers. 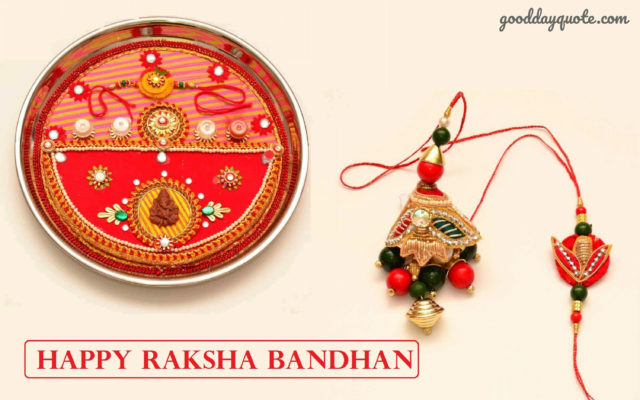 Raksha Bandhan also has links with the practice of exogamy, where a bride is married out of her natal or hometown, and their parents by custom do not visit them. So, every year large number of married women travel back to their parent’s house for the ceremony. Many a time newly married women come a week early and stay till the ceremony. Raksha Bandhan usually has strong prevalence in rural India due to a strong prevalence of exogamy there. While in urban areas, since there is more nuclear family. This festival has become more of tradition but still remains very popular. So, Raksha Bandhan is the festival which represents the bond between brother and sister. And Raksha Bandhan 2018 date in India calendar is 26, August. So, Raksha Bandhan date 2018 is falling on Sunday which is actually a good part because this year u can share your weekend with your loving brother. We hope Raksha Bandhan 2018 make your bond with your brother or sister more stronger. We wish this day bring lots of happiness to every brother and sister in this world. Wondering when is Raksha Bandhan 2018? Well, date of Raksha Bandhan in 2018 is 26 August 2018. Raksha Bandhan 2018 date in India calendar falls on the last day of Hindu Lunar month of Shravan. So, now you know the date of Raksha Bandhan in 2018, book your tickets in advance and celebrate this day with your brother or sister. Want to know Rakhi 2018 date in India, so that you can give a beautiful surprise gift to brother or sister? So, Raksha Bandhan date 2018 is 26 August. And you know what is the plus point its a weekend. So, what are waiting for? order a gift for your brother or sister in advance. Better idea present yourself as a Rakhi gift. We hoped you liked our post on Raksha Bandhan 2018 date and day. We wish that bond between you and your brother/sister become stronger this rakhi. Happy Raksha Bandhan. Keep visiting for more beautiful and motivational quotes. Sharing is caring. So, if you liked our post, Do share with friends.